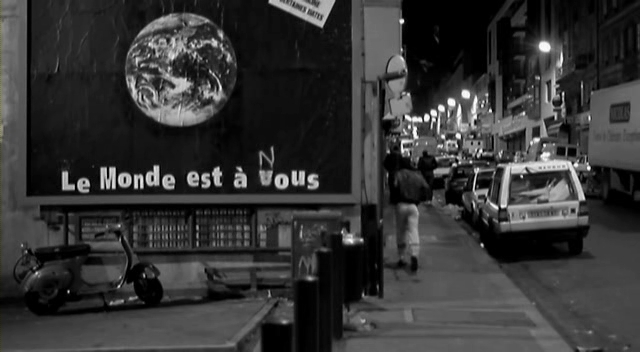 La Haine is a 1995 French drama film, directed by Mathieu Kassovitz. It follows three characters who live in the banlieues on the outskirts of Paris. The three characters are Vinz, Saïd and Hubert. From quite soon into the film we realise that Vinz is, at the very least, slightly unhinged. For example, he stands in his mirror doing an impersonation of Travis Bickle from Taxi Driver. Something is obviously wrong with him. Hubert and Vinz frequently argue so it is Saïd who holds the trio together. As soon as we see Saïd he’s wearing a tracksuit and is stood next to a knocked-over dumpster. He’s surrounded by dilapidated buildings. This film is going to be about the troubles of the lower class. The ‘enemy’ throughout the film is the Police. Although, as many police say on numerous occasions, they’re just doing their job. Like when Vinz is about to shoot a cop, the cop looks terrified; he doesn’t want to be there. I put enemy in inverted commas because you’re never actually sure who to root for. On one hand, some Police are overly brutal towards these youths. But on the other hand, the citizens of the banlieues aren’t exactly perfect citizens, and not all Police are evil as the characters seem to think. Saïd even picks up on this when they go into Paris, when an officer calls him “Sir”. As Hubert says “Hate begets hate…” by hating each other they are just digging themselves deeper, they are a society in freefall. It is still a great film but it’s one of THOSE movies. No matter what I say, someone else will interpret it differently. It does keep you hooked though, and I can honestly say I was never bored. It is a gritty, grim film but there is the occasional joke to lighten things up. Nothing really happens, they just make their way aimlessly through Paris. Like Hubert says the fall doesn’t matter. “It’s how you land!” That quote is similar to the movie itself, nothing really happens up until the ending, which is one of the most shocking and surprising endings ever. These characters are the eruption of all the problems in France at the time. They are blamed for the troubles at the time and the country is collapsing right on top of them. These characters aren’t to blame. They’re just men of their time; no role models, no future, no options. Really interesting review Jack, well done.